It's been a fun year watching those cute Apple commercials urging you to switch to a Mac. Yes, many of us love Apple's beautifully engineered hardware, and may have fallen for the charms of an iPhone (although strictly as a case study in usability... :), but switching to the Mac OS as your primary computing platform? I'm not so sure. Having run Windows Server 2003, Active Directory, and Exchange 2003 on a Mac Mini in the past, I've come to love the form factor. They're virtually silent and virtually invisible— great for that lone server at home. However, if you need to run a few servers, Mac Minis can quickly get very expensive. Using Hyper-V on a loaded server is more effective. Another great application for the Mac Mini form factor - Media Center PCs, aka HTPCs. Sony's great-looking HTPCs are available in a similar form factor. They are comparable, if not more attractive than the Mac Mini. But at $1350, the VGX-TP20E/W— the cheapest of Sony's HTPCs is priced more than what you may have paid for a decent high definition television this past holiday season! Nothing against OS X per se - it has some nice usability touches, along with its own set of quirks. However, if you're used to using Windows, switching isn't exactly as easy as those Apple commercials make it seem. But I moved us to Macs to avoid this kind of hackery....after two weeks of resisting, I am dropping back to Vista on my MacBook, at least during this critical week, when I will be covering both MacWorld and CES and will have no patience for a computer that gets in my way and apps that don't work the way they should. Interestingly, Needleman arrives at the same conclusion as I did: Apple's hardware is great for running Windows Vista. It is also overpriced for running Windows Vista. More in Switcher's lament: The case against Mac on News.com. Over the past year or two, we've come across quite a few switchers who continue to run Windows Vista or Windows XP using Bootcamp, Parallels, or something else. Very alluring, but thanks for now! I'd rather run Windows on a real PC. It's June 30th! I had the date marked because of two reasons. The first one has to do with Windows XP, and if you haven't heard enough already, CBC's Rick Mercer has his own view of how to save Windows XP. Caution: May not be entirely work-safe for some. The second reason's coming up in a post after the break, and it has absolutely nothing to do with Windows XP or Windows Vista! Note to readers: I haven't had to keep a post on hold for as long as I"ve kept this one, contemplating whether I should post it or not. After much thought, I've decided to post this, because it is important to know the facts about downgrade rights, and to clarify my position on this debate. InfoWorld responded to my previous post (read InfoWorld's campaign to "Save Windows XP"). However, in the overall scheme of things will it budge the folks at Redmond to reconsider its plans? Not if Bharat Suneja, an MVP for Exchange and tech guru who publishes the popular Exchangepedia Blog site has anything to say about it. He has done his own research on the matter and his opinion should be heard! Thanks for the kind words Peter - much appreciated. The point Bharat is trying to make: Windows XP is an operating system that has lived past its prime, and Microsoft isn't about to pull the plug on it any time soon. 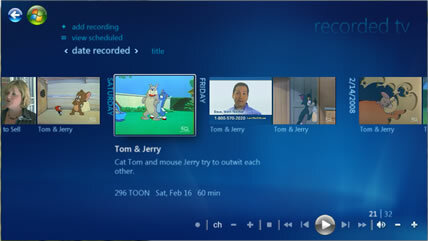 (Users can move to Vista on their own timeline). In fact, Microsoft will soon release a new service pack— Service Pack 3, for Windows XP. You can download Release Candidate 2 of the service pack here. For the record, as the InfoWorld editor who's responsible for the "Save XP" story and related content, there's one big error in this well-reasoned post: XP will not be generally available after June 30 if you are *adding* computers or people. We never said this was an issue of support. It is true that if you have a site license to Vista, you have downgrade rights to XP. But most small businesses and no individual buyers have these rights. They cannot get XP after June 30. And unless they bought new of two specific types of Vista -- the full, not OEM, versions of Vista Business and Vista Ultimate -- they do not have downgrade rights. GIven that practically everyone who buys a computer has just an OEM copy of Windows, they do not in fact have downgrade rights to XP and cannot add new XP licenses to their mix of XP systems. This forces them to have a mix of XP and Vista, whether or not they are ready for Vista. It was this concern that we heard repeatedly in the last year and led to this story. And why we advocated that XP be available for sale indefinitely -- meaning not forever but until the market as a whole is much more ready to move. Thanks for commenting Galen. Having read your follow-up article "The "Save XP" manifesto: Time to get past the distractions", I agree with some of the arguments presented (and greatly disagree with others), and the underlying reasons for the "Save XP" campaign. However, your basic premise that setting a date for end of availability of OEM and retail licenses for Windows XP is like Microsoft giving users an eviction notice is simply not true! I understand that the main issue Galen has is not about existing Windows XP users or computers, but about availability of Windows XP for new computers or users. Carrying the analogy further, that's more like Microsoft saying we aren't accepting new lease applications for this old, run-down apartment that is scheduled to be torn down. You can, however, lease a unit in this brand new complex we built across the street.... It is far from an eviction notice for existing tenants. As far as the downgrade rights Galen referred to (highlighted) in the above comment and in her follow-up article are concerned— she deserves the benefit of the doubt. There's clearly some misunderstanding on her part, and it probably isn't her fault. (Update: Based on our email exchange, I know she has tried to get a definitive answer to this.) Navigating Microsoft's web of licensing options and agreements can be be challenging, even for MVPs. However, to be fair to Microsoft, I was able to get the answer by searching the web, and a single follow-up call to Microsoft Pre-Sales and Licensing. The response was clear and unambiguous. Translation: If you buy a computer and it ships with Windows Vista Business or Ultimate preinstalled by the manufacturer, also known as an OEM license, you can downgrade to Windows XP Professional. You do not need a Volume License of any kind to do that - end users, small businesses with or without an Open License, and larger businesses - again, with or without a Select or Enterprise License, can downgrade to Windows XP Professional, and use it for as long as they wish. A quick call to Microsoft Sales/Licensing confirmed that. You are welcome to do so yourself, by calling 800.426.9400. Select option 5, then option 3. In a follow-up call, Microsoft also explicitly and unambiguosly stated that users can use the OEM media (CD) or the one that came with a prior purchase of a FPP (retail) version to downgrade. Organizations with a volume license can also use their volume license media to downgrade. "The media is not important here, the license is", added the Microsoft rep. If you're having trouble finding your Windows XP CD or need to order a replacement copy, you can do so by calling 800.360.7561 if you bought the retail (FPP) version. The cost is $23, or $29 with taxes and shipping. Volume License customers can order CDs by calling Volume License Fulfillment at 800.248.0655. When asked how long the replacement CDs will be available, and whether these will still be available after Windows XP is no longer sold, the rep responded: "They will be available for quite a while. No plans for discontinuing that yet." Though well-intentioned, some of the arguments presented by Galen are not as valid. Once again, I am neither for or against Microsoft continuing to sell Windows XP, nor profess that users move to Vista whether they're ready or not. However, the implication that Microsoft is forcing users to move to Windows Vista, and terms like eviction notice used in such articles, do not present the issues in the right perspective. Given the facts about Microsoft's product lifecycle, support policies and downgrade rights, is Microsoft's stance wrong here? Or does InfoWorld's Save XP campaign amount to unfairly criticizing Microsoft, as InfoWorld's own columnist J. Peter Bruzzese states in "Save XP? Why bother?"? As Peter Bruzzese points out, the author of Exchangeapedia, Bharat Suneja, suggests that the campaign won't inspire Microsoft to change its plans and keep Windows XP alive beyond June 30. Suneja, it's worth explaining, is a Microsoft MVP. A rare breed, indeed, these disciples are devout enough that, while attending an MVP Summit back in 2001, a pair of them even got married in Redmond, Wash. and read vows from their Pocket PCs. That said, Bruzzese writes that Suneja "has done his own research on the matter and his opinion should be heard." I agree, and particularly when he explains that mainstream support will end on April 14th, 2009, and extended support will be available for five years from that date, till April 8th, 2014, both points IT shops should research. Suneja writes, in his post, "Windows XP doesn't seem like a product that's being retired prematurely." That, obviously, is a matter of some debate. Contrarians can easily point to the reality that Vista sales are not exactly going like gangbusters. If you did read my original post, please accept my apologies. Paul DeGroot, an analyst at Directions on Microsoft, a research firm in Kirkland, Wash., agreed that MVPs are both "in Microsoft's camp" and its "best critics" at the same time. "They criticize from a position of deep knowledge about the products and how customers use them," DeGroot said. "So when they say something, they know what they're talking about, and they're not inclined to take cheap shots. They'd rather fix things than lay blame." MVP or not, my opinion and criticism of InfoWorld in this matter wouldn't have changed. It is sad to note that what is otherwise a well-regarded tech journal is increasingly sounding like the MAD magazine of tech journalism on this topic. InfoWorld's campaign to "Save Windows XP"
I've been an avid reader of InfoWorld for as long as I can remember. It is one of the finest trade publications out there. In case you've missed it, they've been running an online campaign to "save Windows XP". A few weeks ago, they announced that 75,000 XP users had signed up for it (Read "75,000 demand Microsoft keep Windows XP going"). If you look at the numbers, it's a tiny fraction of the overall number of Windows XP users. Update: The last update from InfoWorld is dated Feb. 28th- the number reported is 97,280. InfoWorld says its readers want Microsoft to keep selling and supporting Windows XP indefinitely. Given that Windows XP was released back in 2001 - almost 7 years ago, is Microsoft wrong in ending support for a product that has certainly lived past its shelf life? If you work in the software industry, dealing with today's rapid-fire software releases, it's hard to imagine supporting something that old! Millions of us have grown comfortable with XP and don't see a need to change to Vista. It's like having a comfortable apartment that you've enjoyed coming home to for years, only to get an eviction notice. The thought of moving to a new place -- even with the stainless steel appliances, granite countertops, and maple cabinets (or is cherry in this year?) -- just doesn't sit right. Maybe it'll be more modern, but it will also cost more and likely not be as good a fit. And you don't have any other reason to move. Reading the above, you get the impression that somehow Microsoft can and is actually forcing existing users of Windows XP to stop using that OS past June 30th, 2008. That is completely untrue! All Microsoft is saying is - this product has reached its end of life, and we will stop selling it by that date. It really has no impact on existing users who want to continue using it. The fact is: your licensed copy of Windows XP doesn't come with an expiration date. If you have an XP license today, or buy one by that date, you can install it on any computer you buy two, five, ten, or any number of years from now, provided the hardware is compatible. This does not apply to OEM licenses sold to computer manufacturers like Dell, HP, or Gateway - which are tied to the computer they ship with. - Direct OEM and retail licenses will be sold till June 30th, 2008. - System Builder licenses will be available till January 31st, 2009. - The policy further states that "licenses will continue to be available through downgrade rights available in Volume Licensing programs after end of general availability". - Mainstream support will end on April 14th, 2009. - Extended support will be available for five years from that date, till April 8th, 2014! For a product with General Availability dating back to December 31, 2001, Windows XP doesn't seem like a product that's being retired prematurely. On a second look, InfoWorld's case isn't so much for Windows XP, as it is against Windows Vista. Running alongside the Save Windows XP articles: Why people hate Vista and Time to dump Windows?. Update: To be fair to InfoWorld, they've also recently published "How to deploy Windows Vista". Vista a resource hog? Yes, Windows Vista requires more resources - and the last time I looked around, today's PC hardware was more than adequately equipped for Vista. Most decently-configured laptops, including the entry-level ones that sell for way under a thousand bucks, ship with dual-core processors and 2 Gigs of RAM. And under a thousand bucks get you what can be considered a state-of-the-art quad-core desktop with 3-4 gigs of RAM. In fact, a few weeks ago I was pleasantly surprised by the price of 4 Gigs of RAM for my laptop - $79! It's the same cycle as buying microwaves or vacuum cleaners - they get old, stop working, or simply get in the way and impair users' productivity. When that happens, you go out and buy a new one, generally in the same price range or perhaps a little cheaper, but something that has all (or most of) the bells and whistles - the right stickers, logos, and features that a contemporary microwave or vacuum cleaner would have. PCs are no different. In fact, thanks to Murphy's Law and the underlying technology breakthroughs, we generally get a lot more bang for our buck with every upgrade cycle. If your microwave/vacuum cleaner/PC isn't broken yet (or more importantly, if you aren't fed up with it, and it isn't getting in your way), there's really no reason to buy a new one. Unless you like buying new computers every couple of years, or sooner, and can afford to do so. Drivers: Yes, drivers. Somehow Microsoft is to blame for the perceived lack of drivers. Personally, I haven't come across any piece of hardware recently - a display card, printer, or other peripheral that does not sport a driver for Windows Vista, or otherwise caused any compatibility issues. For most part, everything works out of the box. Security: Security, you say. Seems like Windows Vista has proved its credentials on that front. Agreed, UAC can be a little annoying at times, and gives Apple a great talking point for its commercials, but that doesn't take away from the fact that Vista is a much more secure OS than Windows XP ever was. In fact, Vista does very well on this front compared to other OSes, including Apple's. Read previous post about the 6-month vulnerability report "Numbers talk: Vista most secure OS of all? ", or grab the more current one-year vulnerability report. It is easy to criticize the UAC feature without getting a good understanding of what it does and the problem it's intended to solve for IT departments. After years of extolling the virtues of not logging on using an account with administrator privileges for day-to-day stuff, I love UAC! It ensures administrator privileges are not available to your session all the time - even if you're logged in as an administrator. Not only does this protect computers from malicious code, it also protects users from themselves. When you do need to perform a task that requires administrator privileges, you are prompted for it. Security has a cost - often measured in user inconvenience. Many security products and features come with some inconvenience to users. The argument shouldn't be about whether to have UAC, but about the ability to fine-tune it to an organization's security requirements. Arguably, this could be refined further to allow more granular control, but being aware of the options already available, including the ability to turn it off using Group or Local Policies helps. 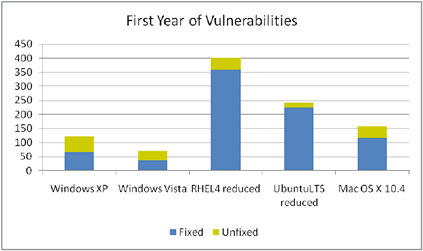 The following graph from the one-year vulnerability report shows vulnerabilities found in Windows Vista, Windows XP, Red Hat Linux, Ubuntu, and OS X in the first year of release. It's clear what the numbers reveal, though many of us often tend to get more influenced by anecdotal evidence- particularly in this context. Vista is slow: One of the more common arguments against Vista, slow is a relative term. Slow as compared to what? Running on the same hardware as my Windows XP computer, performing the same tasks, I haven't noticed this slowness. If you benchmark performance results, Vista can be proven to be slower than anything. The questions to ask: - When was the test conducted? What version of Vista? What kind of hardware? What kind of applications? And more importantly, how slow was it really? Yes, you may lose a few percentage points in performance, but there are gains in usability and new features. The fact of the matter is, Vista is incredible. I've been working with it since Beta 3, and I won't return to that cartoon-looking XP for anything. Not only is it more secure than XP, it includes a host of invaluable new tools and applications (more on those in a bit). Yes, Vista is more resource-intensive than XP. Yes, upgrading from XP to Vista requires putting some cash on the table. But Vista beats XP hands down, and the Save XP campaign amounts to unfairly criticizing Microsoft for adhering to a core capitalist practice: retiring an old product to sell newer, better ones. My 4-year old son agrees with Peter's assessment about XP. For the few days that I had a loaner Media Center PC running Vista, not only did the little one get quite comfortable with it, he fell in love with it. When it was time to get my XP Media Center PC back from repairs, there were angry protests about having to deal with the "yucky Windows" (that would be XP!) that one doesn't ordinarily associate with someone his age. Though a lot of it has to do with the aesthetics - the "X button that glows" when he wants to close a window and Gadgets that expand his vocabulary - isn't the UI and usability a big reason why we choose to use Windows and the exact topic Apple can't stop talking about when it comes to OS X? I finally upgraded the box - the last one I had with Windows XP, to Windows Vista on the last day of 2007. The delay was in large part because of the vendor - name withheld, mislabeled the TV tuner driver, causing a lot of confusion amongst its customers. As a sidenote to this sidenote, Media Center is probably the most mission-critical app of all, as far as end-users/home users are concerned... an email outage at work is probably something you can survive and live to tell the tale. A "TV outage" at home is an event unmatched in its criticality, perhaps deserving a designation higher than P1/S1. If you read a lot of the comments that people have been adding on the Save XP pages, you might note that an awful lot of people say, "Go to Linux," or "That's why I use Linux." You know, I've never heard a Mac user complain about Apple or their Mac, nor a Linux user complain about Red Hat or whatever version they are using. That's not to say they don't have problems; they just keep the discussion among themselves. But they are having a field day watching Microsoft users fight each other. Ever think they're the ones stirring up this whole Save XP campaign? Come on InfoWorld, it's time to give up the skepticism, and that childish campaign. Users are moving to and using Windows Vista, and that will only accelerate going forward, now that SP1 is here. Users and organizations who want to continue using Windows XP can take their own time to upgrade - Windows XP will still be available for the foreseeable future, and supported for a much longer period (as stated in Microsoft's product lifecycle policies referenced in this post). Numbers talk: Vista most secure OS of all? Today's issue of Paul Thurrott's WinInfo newsletter/column (read "Microsoft: Vista More Secure than OS X, Linux" on WinITPro.com) served as a reminder of the stuff I missed at TechEd in Orlando - my first year with exhibitor and staff (yes, they actually issued me one of those as well) badges. Subject: Jeff Jones' Vista 6-month vulnerability report. Jeff Jones is a Strategy Director at Microsoft's Security Technology Unit. This is an update to Jones' earlier 90-day report on Vista vulnerabilities. In this updated report, Jones outlines vulnerabilities announced and patches released for Windows Vista in the first 6 months since its release, and compares it with that of other "modern" operating systems like Mac OS X 10.4, and some Linux distributions like Red Hat Enterprise Linux 4 Workstation (RHEL4w), Novell's SUSE Linux Enterprise Desktop 10 (SLED10), and Ubuntu 6.06. The Linux distributions reported on include the full distributions and a "reduced component set" consisting of essential/default components.  The categorization of a vulnerability as high, medium and low severity is from the National Institute of Standards and Technology's (NIST) National Vulnerability Database (NVD). The score-card looks interesting to say the least. Reportedly, Windows Vista had the least number of vulnerabilities - and patches released in its first 6 months post-RTM. Jones drives home the point that Microsoft's Secure Developoment Lifecycle initiative is paying off. Draw your own conclusions from the score-card below. Read the complete report (PDF) on CSOOnline blog. After I posted about the issues with Windows Vista and virtual CD/DVD emulation utilities (that let you mount ISO images of CDs/DVDs as virtual CD/DVD drives), quite a few visitors responded with details, workarounds and updates on how to make these work - some left comments, and I received a few responses by email as well. Read previous post titled "Vista Annoyance: Virtual CD/DVD emulators and ISO images", and the comments in that post, including link to this post in one of the comments: "Mount ISO image at Windows Vista using Virtual Clone Drive and Daemon Tools"
It seems the whole world has moved to downloadable software images in ISO formats - whether it be puny (by today's standards) CD images of 650/700 MB or larger chunks of code that requires a DVD - a lot of the software we download today is in the form of ISO images that otherwise requires burning the image on a CD or DVD before it can be used. On Windows XP, there were a number of free utilities, including a Microsoft PowerToy called Virtual CD-ROM Control Panel (the cool-product-naming-dept at work again? :), that let you mount ISO images as virtual drives. Once mounted, the image shows up as a CD/DVD drive in Windows Explorer and is usable as such. Virtual Clone Drive (VCD), a free and well-written utility, is one of them. There are others - like MagicISO (full version is about 30 bucks.. ), and Daemon Tools - the latter led me (finally) to VCD back in the Windows XP days. However, none of the above seem to work with Windows Vista, or get past Vista's installer warnings. I tried the current versions of Daemon Tools and Virtual Clone Drive - both resulted in warnings from Vista that they aren't compatible with this version of Windows. Web sites for some of these utilities claim they are, and I don't necessarily doubt that - but after a few reckless deep dives with the blue-screen goodness, I am not for any more of such experiences. The BSOD is something I haven't had the pleasure of working with a lot since the Windows NT and partly through the Windows 2000 days. (The only good part in all of this is my new-found appreciation for Vista's effortless recovery capabilities... ). Microsoft's own utility mentioned above could not be found on the Microsoft web site - I was able to locate a download link that leads to download.microsoft.com - but the utility doesn't work with Windows Vista. It's not listed on the Windows XP Power Toys page either, nor does searching for it return anything on Microsoft's web site. I find it intriguing why such a utility wasn't made part of this brand new next-generation operating system that's supposed to vow you with what it can do! Why can't I right-click on an ISO image and mount it from within Windows Explorer, without having to install some third-party or Microsoft utility, that Vista doesn't want to trust or accept compatibility with? Ran into Steve Riley (Steve is Microsoft's senior security strategist in the Security technology unit, and a "hypnotic" speaker with a great sense of humor. His sessions at technical conferences like Microsoft's TechEd are popular and frequently standing room only... ) at Exchange Connections earlier today. I complained about Vista's auto-tuning feature and my experience with it [read previous post "Windows Vista won't get newsgroup list from news.microsoft.com"]. Read more in this post titled "Windows Vista v/s Hotels" on Steve's blog. Unsettling as the loss of a laptop is - with plenty of other data, I also lost my "database" of over 7000 posts to Microsoft Exchange public newsgroups :( - it is even more unsettling to use a temporary laptop that's running a new operating system - Windows Vista. Don't get me wrong - I love Vista, I love the new UI, and no matter what the detractors say I would move for the new UI and the Aero Glass interface. I've been using it on a second/standby laptop in the past, but not as my primary one. Now I have no options but to use Vista as it shipped on this laptop. I fired up Windows Mail client to get to the Microsoft newsgroups, and Vista would keep timing out after about 60 seconds, showing me Exchange newsgroups for every other language but English! After Googling it for a little bit, the conclusion was Vista's auto-network tuning feature was the culprit. Voilà - the problem's gone, I instantly got the entire list of newsgroups! Another issue that this auto-tuning feature was clearly responsible for - I could not RDP to my servers at home - it created the connection, I can see the server's screen but it's blank - no login GUI (GINA) from those servers. When I VPNed into work and tried to access the servers using RDP from a Windows Server 2003 box, it worked like a charm. Nevertheless, I'm happy I got both of the above fixed, and in the process realized the issues stuff like auto-tuning might be creating for users. I've stopped claiming any kind of expertise on client operating systems for a while now, so I'm not sure under what scenarios the auto-tuning feature may actually be useful. For what it's worth, these are the performance enhancements from the "next generation TCP/IP stack". On a second thought, this probably explains the inability to copy an 18 Gig virtual machine image (VHD file) on another laptop running Vista - it would get stuck at 5% and not move beyond that. Windows XP copied the same file in a few minutes! News.com: U.S. government outlaws Windows Vista! In a tongue-in-cheek news headline (yes, there's just the headline and a brief excerpt - the actual news report is missing), CNet's News.com posts "President Bush signs measure decreeing that Microsoft's operating system is so complex it poses a national security threat". In case you haven't guessed it, this was News.com's April Fool's Day special edition. With several other interesting headlines that don't seem to be outside the realm of possibility, but obiviously aren't true. For instance, Larry Ellision suing Forbes magazine for not being included in the top 10 of Forbes' billionaires list. Read the News.com April Fool's Day special edition. Windows Vista: Love the packaging? Just got my 2 copies of the boxed version of Windows Vista Ultimate. Can't call them shrink-wrapped versions, they actually come in a plastic case. A quick web search revealed I'm not the only one (ref. to this thread on Anandtech). It's easy to miss the sticker on the side with little pictures that show how to open it. The box-opening issue aside, Windows Vista is one of the coolest things Microsoft's done in a while (surpassed - on the IT Pro side - only by what the Exchange team's done with Exchange Server 2007, imo! Exchange Server 2007 SP1 will raise the bar even further - read Terry Myerson's post about SP1 features on the team blog), regardless of what the Mac fanatics have to say about the former, and myriad distractors about the latter. Windows Vista: Is there really a lack of interest? Almost every single day for past few weeks, I've been asked by someone or the other if Windows Vista is available yet, and whether they should upgrade. Last night it was a teenager at a SonyStyle store in San Jose, where I happened to wander to take a peek at new Vista laptops. (Yes, I'm a big fan of Sony laptops and the aesthetics. I think only Apple does it better - and keep telling myself one of these days I'll switch to an Apple MacBook Pro if it can run Widnows Vista flawlessly, and has all the drivers - including the one for the built-in iSight webcam - Bharat). However, if many analyst and media reports are to be believed, nobody really cares. Windows Vista suffers from a lack of interest. Nobody camped outside Best Buy and CompUSA overnight to get their hands on the first copies of Windows Vista at midnight, and therefore Windows Vista is doomed! The fact is, more than a few folks I know delayed computer (particularly laptop) purchases over the last few months (including yours truly... - Bharat), as they awaited newer laptops pre-loaded with Windows Vista. No, the "express upgrade" or other such free offers for Windows Vista were not attractive enough - it would still leave it up to users to upgrade their OS, and perhaps even pay a small shipping or media charge to computer manufacturers for getting the Vista media. Unlike the much hyped Sony PS3 (and perhaps the Wii - which wasn't suffering from any shortages afaik... ) launches in recent memory, Windows Vista is not a piece of hardware that can be in short supply. Unlike hardware, you can buy it online, and download it. Besides, the demographics that Windows Vista caters to is much broader than the one game consoles cater to. The product launches one should compare Windows Vista's launch with are not the PS3 or the Wii, or even the Xbox 360 if you will. The ones that even come anywhere close are Apple's OS releases (with all of Steve Jobs' media finesse and personal charm thrown in... ), or the new Linux version from your favorite Linux vendor. Yes, it was too long in the making, which had some impact on the excitement such a launch could generate. Paul Thurrott sums it up in his WinInfo column [read "The 'Duh' Starts Now: Weighing in on the Vista Launch"] on WindowsITPro. "Put simply, Vista was a blockbuster waiting to happen. The fact that there were few people lining up the night of the launch says more about the maturity of the market than it does about Vista's performance", says Thurrott. The sales numbers over the next few months and years will speak for themselves, and perhaps create a bigger impact than the product launch. Windows Vista RoI: BitLocker drive encryption enough to justify upgrades? According to analyst Jon Oltsik of Enterprise Strategy Group, Windows Vista's BitLocker drive encryption system provides enough RoI to justify the upgrade for enterprise customers. PC encryption tools have now become a "must-have" and most enterprises are considering deploying such tools. Standalone drive encryption utilities cost $100-$200 per system in acquisition cost alone. Add to that installation, configuration and ongoing support costs, and the upgrade to Windows Vista - which includes drive encryption (and other security and management features) - begins to look quite attractive. More on CNET News.com - "Windows Vista and the secret of full disk encryption". If you're using a version of Windows Vista since Beta 2 (including RTM), the version of IE7 included with Vista does not have or support the DHTML Editing (ActiveX) control that allows you to compose or reply to messages in Outlook Web Access. As a result, when you try to compose or reply to messages using OWA, you see the part of the message where you would type your message body is grayed out (like a missing image). Like many IT folks, if you're ahead of the pack and now have Windows Vista RTM running on your laptop or workstation, you're probably wondering about or may already have tried running Windows Server 2003 admin tools (adminpak.msi) and Exchange System Manager on Vista. These admin tools are not officially supported on Vista yet. MVP Daniel Petri has a workaround for installing adminpak on Vista. We'll probably have to wait a little longer for Exchange System Manager. Just tested Windows Vista RC2 (Build 5744.16384) on a Sony Vaio SZ320P laptop. This slim little laptop has a WXGA display (1280 x 800), comes with a 1.86 Ghz Core 2 Duo processor and 64 Mb. video memory. I'm very comfortable running this build - it looks and performs like a finished product, good to go. (I'm yet to load all my software on it, but the stuff I've loaded so far seems to work without issues). The Aero interface is very cool - and though many power users may not see that as a reason to upgrade, I find it very attractive and certainly a major reason for upgrading (besides all the security features). Isn't it all about the user experience? If you're a Windows user who has envied overall look and feel of Apple's OS X operating systems, albeit not the exact implementations of particular features because they don't feel that intuitive thanks - in part at least - to years of using Windows, Vista with Aero is exactly what you need! Nevertheless, the laptop's WXGA format display with its 800 pixel vertical resolution isn't adequate for me, particularly when using and demonstrating stuff using Virtual Server client or RDP. It takes a lot of scrolling to be able to show different parts of a screen. The laptop also says it is Windows Vista Premium Ready, including the Windows Aero user experience. I would consider at least 128 Mb. dedicated video RAM - though this seems to be doing just fine with half that amount. There's a TPM chip (Trusted Platform Module), but not sure if it's version 1.2. This would be nice to have to be able to use BitLocker drive encryption - but as Microsoft's Security Strategist Steve Riley [Steve's blog] explained at TechMentor earlier this week, you can use BitLocker encryption *without a TPM chip*. It also has a fingerprint scanner nestled between the right and left mouse buttons below the keyboard - makes it very convenient to be able to logon. I like the laptop's brushed aluminum finish around the keyboard and black carbon finish on both lids. The built-in webcam worked fine with XP but doesn't have drivers for Widows Vista yet. One thing that did work very well is Bluetooth - Vista did not require any other Bluetooth drivers/software, it has a Bluetooth stack built-in, afaik. Overall, an excellent laptop for travel. I will wait to find a model with at least 128 Mb. video memory, RAM expandable to 3-4 Gigs (to be able to run Virtual Server and a few VMs), and perhaps Vista pre-loaded (or at least see Vista drivers posted on Sony's web site) before I decide to use this as my primary laptop. My ideal laptop of choice for running Vista - an Apple MacBook Pro (or even the newer MacBook). The latter doesn't have dedicated video RAM - it uses shared video memory like many lower-end laptops. Finally Apple just shipped Windows drivers for the built-in iSight webcam. I'm waiting for Apple to ship those with Core 2 Duo processors. Fired up the console (command prompt) in Windows Vista and can't telnet to smtp or use telnet at all for that matter? Just noticed this on Windows Vista RC1 - Telnet is not installed by default... and the HyperTerminal app is history as well. Paul Thurrott over at Windows IT Pro mag is gung ho about Windows Vista now. Amazingly, his stand has changed from (frequently and highly) critical to almost a Vista fan within a few builds. Self-admittedly so. Here's what he had to say about build 5536 in Windows IT Pro newsletter today. I can say this. I've been very critical of the quality of Vista prerelease builds, and deservedly so. But that's changed with last week's release of Vista build 5536, which is a so-called "escrow" build for RC1. (Beta testers received build 5536 last Friday; MSDN and TechNet subscribers will get it some time this week.) The suddenness with which Vista has gone from unusable to desirable is quite shocking. With build 5536, the performance is amazing. All the bugs that have bedeviled me since Beta 2 and beyond are fixed. Hardware that never worked properly with Vista suddenly configures and works fine, with no user intervention. It's like Microsoft flipped the "start working" bit. It just works. Thanks for the update Paul - I was hoping it'll get to be more like a shiny new Windows version real soon, but didn't expect it to happen almost overnight like it did! Catch up on build 5536 on Paul's Supersite for Windows. I recently saw a new font installed on my "production" laptop (running Windows XP SP2) - Calibri. Calibri is a beautiful humanist sans serif typeface, and one I started using immediately as the default in Word documents and email. My earlier attempts at using another font that seems to have been installed with Vista (no, I don’t have Windows Vista beta/CTP installed on my production laptop yet… but more about that in a moment) became quite unpopular around here. I’m trying to figure out if it was the IE 7 beta that installed these fonts on my laptop, or perhaps Office “12” beta. Either way, as someone who’s very interested in typography and graphic design, I do love Calibri enough that I’m using it for this blog. ("Update: In a later redesign, Calibri was replaced with the equally beautiful and very readable Cambria.) You may (or may not… ) have noticed the change when you view these pages in your browser. If you don’t have the font, it will get substituted for some other sans serif font on your computer. If you’re curious enough to find out what Calibri looks like, head over to Wikipedia (Wikipedia as a type catalogue... great!). If you search the web, you may be able to find links to download the font. I would love to find out what you think about Calibri – leave a comment here if you feel strongly about this font (and the others included with Windows Vista / IE 7 / Office “12”).